Zhu Xi, whose family originated in Wuyuan County, Huizhou (in modern Jiangxi province), was born in Fujian, where his father worked as the subprefectural sheriff. 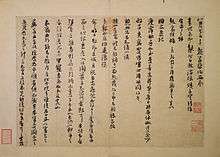 After his father was forced from office due to his opposition to the government appeasement policy towards the Jurchen in 1140, Zhu Xi received instruction from his father at home. Upon his father's death in 1143, he studied with his father's friends Hu Xian, Liu Zihui, and Liu Mianzhi. In 1148, at the age of 19, Zhu Xi passed the Imperial Examination and became a presented scholar. Zhu Xi's first official dispatch position was as Subprefectural Registrar of Tong'an (同安縣主簿), which he served from 1153 - 1156. From 1153 he began to study under Li Tong, who followed the Neo-Confucian tradition of Cheng Hao and Cheng Yi, and formally became his student in 1160. In 1179, after not serving in an official capacity since 1156, Zhu Xi was appointed Prefect of Nankang Military District (南康軍), where he revived White Deer Grotto Academy (白鹿洞書院). and got demoted 3 years later for attacking the incompetency and corruption of some influential officials. There were several instances of receiving an appointment and subsequently being demoted. Upon dismissal from his last appointment, he was accused of numerous crimes and a petition was made for his execution. Even though his teachings had been severely attacked by establishment figures, almost a thousand brave people attended his funeral. In 1208, eight years after his death, Emperor Ningzong of Song rehabilitated Zhu Xi and honored him with the posthumous name of Wen Gong (文公), meaning “Venerable gentleman of culture”. Around 1228, Emperor Lizong of Song honored him with the posthumous noble title Duke of (State) Hui (徽國公). In 1241, a memorial tablet to Zhu Xi was placed in the Confucian Temple at Qufu, thereby elevating him to Confucian sainthood. Today, Zhu Xi is venerated as one of the "Twelve Philosophers" (十二哲) of Confucianism. Modern Sinologists and Chinese often refer to him as Zhu Wen Kung (朱文公) in lieu of his name. Zhu Xi's offspring held the title of Wujing Boshi (五经博士; 五經博士; Wǔjīng Bóshì). In 1452 Wujing Boshi was bestowed upon the offspring of Mengzi-Meng Xiwen 孟希文 56th generation and Yan Hui-Yan Xihui 顔希惠 59th generation, the same was bestowed on the offspring of Zhou Dunyi-Zhou Mian 週冕 12th generation, the two Cheng brothers (Cheng Hao and Cheng Yi-Chen Keren 程克仁 17th generation), Zhu Xi-Zhu Ting 朱梴 (Zhu Chan?) 9th generation, in 1456-1457, in 1539 the same was awarded to Zeng Can's offspring-Zeng Zhicui 曾質粹 60th generation, in 1622 the offspring of Zhang Zai received the title and in 1630 the offspring of Shao Yong. In terms of li and qi, Zhu Xi's system strongly resembles Buddhist ideas of 理 li (again, principle) and 事 shi (affairs, matters), though Zhu Xi and his followers strongly argued that they were not copying Buddhist ideas. Instead, they held, they were using concepts already present long before in the I Ching. Zhu Xi advocated 格物致知 gewu zhizhi, the investigation of things. How to investigate and what these things are is the source of much debate. To Zhu Xi, the things are moral principles and the investigation involves paying attention to everything in both books and affairs because "moral principles are quite inexhaustible". Zhu Xi did not hold to traditional ideas of God or Heaven (Tian), though he discussed how his own ideas mirrored the traditional concepts. 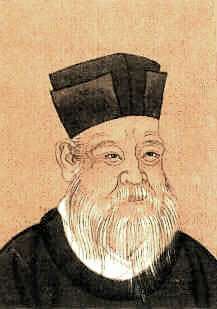 He encouraged an agnostic tendency within Confucianism, because he believed that the Supreme Ultimate was a rational principle, and he discussed it as an intelligent and ordering will behind the universe (while stating that "Heaven and Earth have no mind of their own" and promoting their only function was to produce things. Whether this can be considered a conscious or intelligent will is clearly up to debate).<See W.T.Chan Source-Book Zhu Xi, Ch. 11, # 127, pg. 643> He did not promote the worship of spirits and offerings to images. Although he practiced some forms of ancestor worship, he disagreed that the souls of ancestors existed, believing instead that ancestor worship is a form of remembrance and gratitude. Zhu Xi wrote what was to become the orthodox Confucian interpretation of a number of concepts in Taoism and Buddhism. While he appeared to have adopted some ideas from these competing systems of thought, unlike previous Neo-Confucians he strictly abided by the Confucian doctrine of active moral cultivation. He found Buddhist principles to be darkening and deluding the original mind as well as destroying human relations. The postscripts by Wen Tianxiang (1236～1283) of Song dynasty, Fang Xiaoru (1375～1402), Zhu Yunming (1460–1526), Tang Yin (1470～1523) and Hai Rui (1514～1587) of the Ming dynasty. ↑ Confucius; Slingerland, Edward (2006). The Essential Analects: Selected Passages with Traditional Commentary. Hackett Publishing. p. 148. ISBN 1-60384-346-9. ↑ "World Architecture Images- Beijing- Confucius Temple". Chinese-architecture.info. Retrieved 2013-04-22. 1 2 H.S. Brunnert; V.V. Hagelstrom (15 April 2013). Present Day Political Organization of China. Routledge. pp. 494–. ISBN 978-1-135-79795-9. 1 2 "Archived copy". Archived from the original on April 25, 2016. Retrieved April 17, 2016. 1 2 Chang Woei Ong (2008). Men of Letters Within the Passes: Guanzhong Literati in Chinese History, 907-1911. Harvard University Asia Center. p. 132. ISBN 978-0-674-03170-8. ↑ Wilson, Thomas A.. 1996. “The Ritual Formation of Confucian Orthodoxy and the Descendants of the Sage”. The Journal of Asian Studies 55 (3). [Cambridge University Press, Association for Asian Studies]: 559–84. doi:10.2307/2646446. http://www.jstor.org/stable/2646446 p. 571. 1 2 Chan 1963: 589. 1 2 Red Pine, Poems of the Masters, Copper Canyon Press, 2003, p. 164. ↑ The Complete Works of Chu Hsi, section 26 in Chan 1963: 609. ↑ The Complete Works of Chu Hsi, section 27 in Chan 1963: 610. ↑ The Complete Works of Chu Hsi, section 147 in Chan 1963: 653. ↑ The Complete Works of Chu Hsi, section 138 in Chan 1963: 647. Wikimedia Commons has media related to Zhu Xi. "Zhu Xi". Internet Encyclopedia of Philosophy.